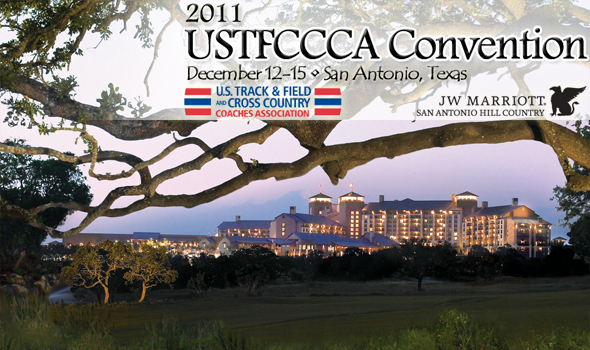 NEW ORLEANS – The upcoming week will be packed with big events at the 2011 USTFCCCA Convention. From keynote speaker NCAA President Dr. Mark Emmert to the third-annual announcement and presentation of The Bowerman to the first-ever Women’s Summit, attendees can look forward to a slate of can’t-be-missed events that complement a full schedule of symposiums, technical seminars, and business meetings. The Convention will be held December 12-15 at the JW Marriott Hill Country in San Antonio, Texas. Among many educational opportunities at this year’s convention, the symposium sessions will feature a wide array of some of the brightest minds in the sport. Each scheduling block will contain sessions on sprints, jumps, throws, and endurance training and tactics. Monday will feature four sessions while Tuesday and Wednesday will contain two scheduling blocks, apiece. Coaches and clinicians scheduled to appear include: Dennis Shaver, James Thomas, TJ Crater, Sean Cleary, John Stuart, Boo Schexnayder, Scott Cappos, Scott Abbott, Andy Eggerth, Cliff Rovelto, Mike Maynard, Houston Franks, Mike Young, Jim VanHootegem, Jud Logan, Jim Pennington, Randy Gillon, Nic Petersen, Jennifer Michel, Caryl Smith-Gilbert, Rock Light, Scott Cappos, Gina Procaccio, Lonnie Greene, Steve Thomas, Jerry Clayton, Gary Wilson, Sarah Hesser, Kebba Tolbert, Joe Walker, and James Li. President of the NCAA Dr. Mark Emmert will speak during the convention’s opening session on Tuesday at 11:00 a.m., central. Emmert has taken a strong leadership position in his first year of heading the NCAA and is at the forefront of many of the issues facing collegiate athletics. Flotrack.org will broadcast the opening session and Emmert’s speech live. In what is becoming a great end-of-the-year wrap to track & field season, The Bowerman ceremony on Wednesday night (7 p.m., central) will crown the nation’s best male and female collegiate athlete from 2011. The men’s finalists are Jeshua Anderson (Washington State), Ngoni Makusha (Florida State), and Christian Taylor (Florida). Women’s finalists are Jessica Beard (Texas A&M), Kimberlyn Duncan (LSU), and Tina Sutej (Arkansas). Reigning women’s winner of The Bowerman Queen Harrison (Virginia Tech) will be among the night’s special guests. Track & field commentator Lewis Johnson (Universal Sports, NBC Sports, ESPN) will host the evening’s events. Flotrack will webcast the ceremony and, for the first time, an hour-long preview show beforehand. Coverage begins at 6 p.m., central, with the “Flotrack Red Carpet Show at The Bowerman” hosted by Ryan Fenton and Alex Lohr and will feature a behind-the-scenes look at the USTFCCCA Convention and the ceremony. Starting at 9 p.m., central, will be the USTFCCCA Coaches Hall of Fame induction ceremony. Flotrack again will provide a live webcast of the event. Those to be inducted as part of the Class of 2011 include: Phil Esten (UW-La Crosse), Keene Fitzpatrick (Michigan/Yale/Princeton), Ken Foreman (Seattle Pacific), Craig Poole (BYU), Phyllis Sweat (Hampton/Norfolk State), Bill Webb (Cal State Northridge/Tennessee). On Thursday, the convention will conclude with the first-ever USTFCCCA Women’s Summit. From one of the most influential people in the history of Title IX to the co-chairs of the NCAA Women’s Leadership Symposium, an outstanding line-up of speakers headlines what is sure to be a great educational experience. Coverage of the USTFCCCA Women’s Summit can be found on the USTFCCCA’s Twitter feed throughout the day (hashtag: #WomensSummit). In addition to all the live webcasts, Flotrack will also provide coverage throughout the week featuring interviews with many of the nation’s coaches. Be sure to follow the USTFCCCA (hashtag: #USTFCCCAConv) on Twitter for updates throughout the week. For The Bowerman ceremony, use hashtag #TheBowerman. The Bowerman, which debuted in 2009, is presented annually by the USTFCCCA to the most outstanding male and female collegiate track & field athletes in the nation. Oregon’s Ashton Eaton and Virginia Tech’s Queen Harrison are the reigning winners of The Bowerman, which is named for legendary Oregon track & field and cross country coach Bill Bowerman. For more information on The Bowerman, the award, the trophy, and Bill Bowerman himself, visit TheBowerman.org. The U.S. Track & Field and Cross Country Coaches Association (USTFCCCA) is a non-profit professional organization representing cross country and track & field coaches of all levels. The organization represents over 8,000 coaching members encompassing 94% of all NCAA track & field programs (DI, DII, and DIII) and includes members representing the NAIA as well as a number of state high school coaches associations. The USTFCCCA serves as an advocate for cross country and track & field coaches, providing a leadership structure to assist the needs of a diverse membership, serving as a lobbyist for coaches’ interests, and working as a liaison between the various stakeholders in the sports of cross country and track & field.